Soooo friday already?! This week has flown! Yesterday I went to KMart to buy Luke Toy Story 2, you see I bought number 1 but for the life of us, we cannot find the disc?! I think Luke has taken it and hidden it as it is his favourite movie at the moment. So while I was there I picked up Ice Age 1 & 2 and Over the Hedge. They were having a sale so I got all of them for $55. Sweet. He fell asleep as we were going through the checkout. He hasn't done that EVER in his 3 short years! He must have been so tired as he hasn't been sleeping well lately. He didnt even stir when I out him in the car or when I put him into bed. So we had a 2 1/2 hour nap. Today I went to the school to watch the assembly as Kate's class was presenting it. She has been practising her line all week. "Thankyou for a beautiful item 3H." She was superb! She didn't waver or anything! Then on the way home I walked past the high school and they were having their cross country carnival. I was Red House Captain when I was in primary school. The other captain was a boy I previously played soccer with when I was younger, Alex. I was good at Cross Country and remember one year our school won a big shield at the District Carnival and I and other person, Todd, had to collect it as we had won our races. As we were walking back I thought he had a hold of the shield so I let go of it and we almost dropped it. LOL. I don't really know why we make plans as they never turn out! I bought tickets for Jamberoo months and months ago and we kept saying 'we have to go, we have to go' and well we havent as yet. We decided last week that we would go yesterday, sunday, but of course it was cold and windy so we didnt end up going. We plan to go this sunday though. 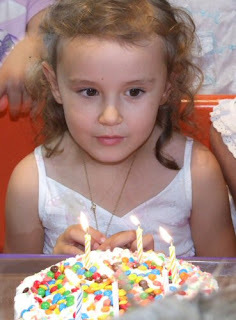 We plan to go down to Kiama on saturday and stay in a motel and play at the beach etc. Then get up early on sunday and go to Jamberoo. Lets hope it stays fine this coming weekend. So instead we did stuff around the house on saturday. Just tidying etc. Then up I went to vote. You see Steve is a Kiwi and is not a citizen so he loves voting day, as he doesn't have to vote. Then I went to get some takeaway for lunch - Red Rooster - yummmm. I also went to the real estate as I have found a house that has everything we want - I just hope it doesn't get sold before we get our loan. Fingers crossed. Then we went for a drive and we ended up at Cronulla. I was sick, Red Rooster isnt so good coming back up and getting stuck in your nasal cavity... Then we just played on the beach and in the rock pools. Luke, in typical Luke fashion, got wet from head to toe, yes, fully clothed too. And Kate had fun collecting shells. I didn't take my camera or anything and I am kind of glad I didn't. I just loved playing with the kids instead of watching them through a lens! Then to home where I fell asleep in the car to keep myself from being sick. ARGH! How long does this sickness last?!?!?! Not to mention the sleepiness!!! Saturday night I slept for 9 hours. Then went back to bed at 8.30am till 10am. Then I had another hour nap in the afternoon and still went to bed at 10.30pm. All I do is sleep and it is driving me crazy!!! Nothing is getting done! I am over it too. I am over everything right now. I just feel like being a big ol whinging sook. Right now. Right now I am sitting here still in my PJ's even though it is 12.20. I have been going for a shower for the last 2 hours, I just havent made it there yet, I decided to strip and remake the beds instead and clean Luke's room. Also the postie dropped off the latest For Keeps and I thought I would have a quick flick and lo and behold one of my layouts was in it, one of ET entries. They also have the details for the new ET comp in there. Due August 31st so 5 months to get 5 layouts done. Should be doable. Right now Kate is at school. Luke is here playing on his magnetic drawing thing. Oh wait, he has just dissapeared. He was getting food. That boy had eaten all his packed lunch by 10am. You see he was supposed to go to family day care today but the carer is having family issues so I kept him home. Right now the iron is on as I was waiting for it to heat up to iron my clothes to go to the shop. I want to buy Luke one of those rails for his bed so he doesn't keep falling out. I also might get out the kids winter clothes layby. Yeah I might do that too. I have to think about what to cook for dinner without making myself feel sick. Not so doable. I might get a sandwich - cream cheese spread. Mmmm. Bit of a favourite at the moment. And a glass of milk with chocolate nesquick. Yep. Sounds good right now. Also thinking of going to the library and picking up a copy of To Kill a Mockingbird. We shall see how Luke performs first I think. Right now I am ignoring the washing up that needs to be done and wishing I had a dishwasher. Have to wait till we move first. Right now I am going to stop babbling random thoughts and go and get that sandwich. You know the old wives tale, if you give your baby stuff away sure enough you will fall pregnant. I knew I shouldn't have given away my pram and portacot! Yep, 8 weeks and 1 day today. We are due on our Wedding Anniversary! I haven't been well. I have even lost a kilo. Just the very thought of food makes me feel sick! Bring on the next 4 weeks! I can't wait to be over this sickness. I am hanging up my scissors and glue for a while. I am a little over scrapbooking at the moment. I am not finding joy in it. I find it quite boring and time consuming at the moment. Kate turned 6 a week ago. We had a McDonalds party on the weekend. It was great! Cheap too, and I didnt have to clean up. I went to buy her a new dress to wear and I couldnt find one anywhere! I went to Pumpkin Patch to look at the maternity clothes and saw a beautiful dress down from $46 to $20. I ended up spending $57 but saved $83! Talk about some great bargains! 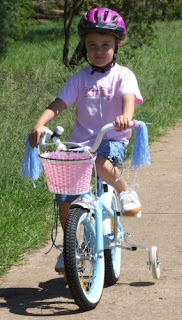 Kate received a bike for her birthday off us. She loves riding it. Luke on the other hand has still not managed to work out how to ride his bike. He will not use those pedals for the life of him! For a kid that can stand 5 meters away and scon you in the head with a ball, I thought for sure would pick up how to ride a bike really easy. Apparently not. I guess thats it from me. Not much has been happening around here, especially no housework. If I am not sitting around feeling ill, I am so tired I can barely move. Lets hope the next couple of weeks goes really fast! SO you see I was trying to go a whole month without posting. No, just kidding. We received some news the other week which really rocked our socks and well we have come to terms with it and are moving forward. Details to follow. So while I have been mostly offline, I can say that I got all that cleaning done. My house was spotless. Perfect. Two weeks later, you cant really tell. I am dissapointed. Anyone got some good tips for helping kids help? Thanks for everyones comments. I like to know that I am normal. I dont want to be extraordinary. I just want to be ordinary, normal. I have scrapped a bit, but thats only because I am in two comps at the moment. I am competing in Reality Scraps over at Scrapbook City. The layouts for that comp are Joy and Friday Favourite. I am also competing in The Big Challenge over at Bon's Scraps. The layouts I have done for that comp so far are Nambucca and Rain, rain dont go away. The first layout - Joy - you could only use the MM patterned paper, no cardstock, and you had to use the 8inch MM chipboard shape and you had to put your journalling on it. The second layout - Friday Favourite - you could only use cardstock, no patterned paper at all. You also had to have a handmade embellishment, use either a pice of bling or fancy edged bazzill, and a handcut title. The third layout - Nambucca - had to use the colour combo aqua and peach. When I first read the challenge, I was like, What The?! but I love it now! 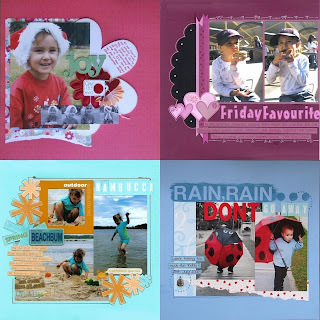 The fourth layout - Rain, rain dont go away - had to use the colour combo blue and red. I tell you, the challenges arent easy but I am enjoying doing them. I know I am sad, but I have already started on my BTP for this years Scrabooking Memories Masters comp! I just want to not leave it to the 11th hour like I did last year. I have been thinking about challenging myself (I am doing nothing but challenges lately! LOL!) to take a photo a day. Maybe every two days. LOL. I will start today and see how I go I think.